UPDATE: here is opencv c++ sample and shows exactly what I want to do. Only thing is I need it with java. I have been working on a real-time Android application which detects face with front camera and add a mask on a detected face. So far face detection is working well with cascade classifier. If anyone could give a tip or tell me some key points, I would be so grateful. This is a good example what I expect from my application. I have examined the code though but couldn't understand. 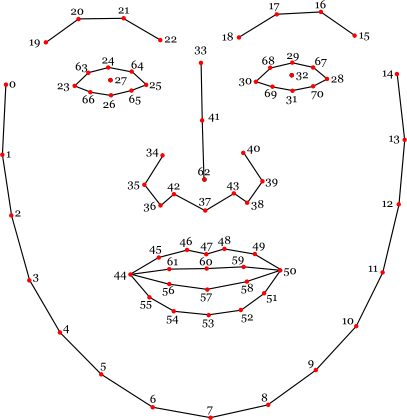 You have to extract the landmarks of the face (a good library is http://dlib.net/). For this task it's not really necessary to use the Haar Cascade Classifier to detect the face. But it could help if you pass just a portion of your image (the section with only the face) to the algorithm that calculates the landmarks. In this case, with less data to compute, the algorithm should be faster. But remember to re-map the points to the original coordinate reference system of the full image. Once that you had obtained this points you can easily overlap the image you need on the various frames captured from your camera. Here is a working code for me for putting mask. Not the answer you're looking for? Browse other questions tagged android opencv real-time face-detection cascade-classifier or ask your own question. How to implement Face masking on live camera?